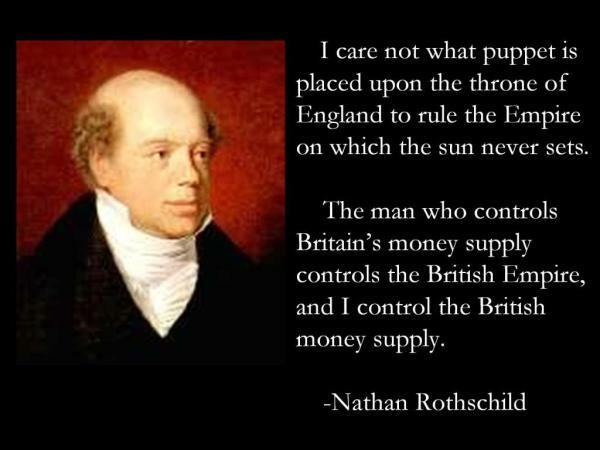 The Masonic Jewish owners of the central banks are behind all imperialism, including the colonization of humanity. The “New World Order” is an extension of British and American imperialism which are proxies for Masonic Jewish mercantilism. Conspiracy theorists believe modern history reflects a long-term conspiracy by an international financial elite to enslave humanity. Like blind men examining an elephant, we attribute this conspiracy to Jews, Illuminati, Vatican, Jesuits, Freemasons, Black Nobility, and Bildersbergs etc. The real villains are at the heart of our economic and cultural life. They are the dynastic families who own the Bank of England, the US Federal Reserve and all central banks and associated cartels. They also control the World Bank and IMF and most of the world’s Intelligence agencies. Their identity is secret but Rothschild is certainly one of them. The Bank of England was “nationalized” in 1946 but the power to create money remained in the same hands. England is in fact a financial oligarchy run by the “Crown” which refers to the “City of London” not the Queen. The City of London is run by the Bank of England, a private corporation. The square-mile-large City is a sovereign state located in the heart of greater London. As the “Vatican of the financial world,” the City is not subject to British law. The British Empire was an extension of bankers’ financial interests. Indeed, all the non-white colonies (India, Hong Kong, Gibraltar) were “Crown Colonies.” They belonged to the City and were not subject to British law although Englishmen were expected to conquer and pay for them. The Bank of England assumed control of the U.S. during the T.R. Roosevelt administration (1901-1909) when its agent J.P. Morgan took over 25% of American business. (Anton Chaitkin, Treason in America, 1964). According to the “American Almanac,” the bankers are part of a network called the “Club of the Isles“ which is an informal association of predominantly European-based royal households including the Queen. The Club of the Isles commands an estimated $10 trillion in assets. It lords over such corporate giants as Royal Dutch Shell, Imperial Chemical Industries, Lloyds of London, Unilever, Lonrho, Rio Tinto Zinc, and Anglo American DeBeers. It dominates the world supply of petroleum, gold, diamonds, and many other vital raw materials; and deploys these assets at the disposal of its geopolitical agenda.